These days, more people are relying on VoIP, or voice over Internet protocol, to make phone calls. This technology is used both in everyday life and for business purposes. Instead of using traditional phone lines, VoIP uses the Internet to make voice or video calls. There are definite advantages to using this technology that should be explored. In both our business and personal lives, we are increasingly expected to be available and reachable at any time of the day. In fact, for a business, this is a near necessity for anyone trying to stay competitive. Being tied down to a specific phone line, location, or even time zone, is tantamount to business suicide, and that’s where the VoIP phone systems really shine. These services allow users to be anywhere at any time without missing a beat. Wherever someone travels across the globe, their office can come right along with them thanks to the brilliant technology behind the IP telephone system. As long as there is broadband, the VoIP customer is connected to everything as if they were sitting right at their office desk back home. Customers can even check in on their VoIP messages via email when taking calls is not an option. VoIP calls tend to be much cheaper than those made with traditional phones. VoIP uses an existing connection, the Internet, so there is no need to install additional hardware. In addition, users can call anyone, no matter where in the world they reside, and end up paying far less. This allows people to forgo buying international calling plans for a landline or cell phone, which can be expensive. Cost-efficiency can be an attractive feature for anyone, but will particularly speak to the small business owners who can benefit the most from VoIP. Since users pay a flat service or nominal fee for their hosted phone system, the overall bill at the end of the month is considerably less than with conventional calling plans. This is especially true of long distance calls. What’s more, VoIP telephone systems come with a bundle of added features for no additional cost. There are many advantages to a VoIP system, but a few stand out as most important in terms of cost for a business. By using a virtual phone, a business doesn’t have to invest in a private branch exchange (PBX) system. This requires connecting multiple phone lines to a traditional switchboard system that is serviced by the local telephone company. If a business already has a Local Area Network (LAN) for their computers to connect to each other and to the Internet, they already have the technology in place for using VoIP software. Through Internet telephony, users in the business make multiple phone calls across the same LAN data connection via a digital packets based system. Your business does not experience a loss of telephone systems operations when inclement weather affects local telephone lines. You can get a satellite-based Internet connection and keep calls going in and out of your business 24 hours a day, seven days a week. 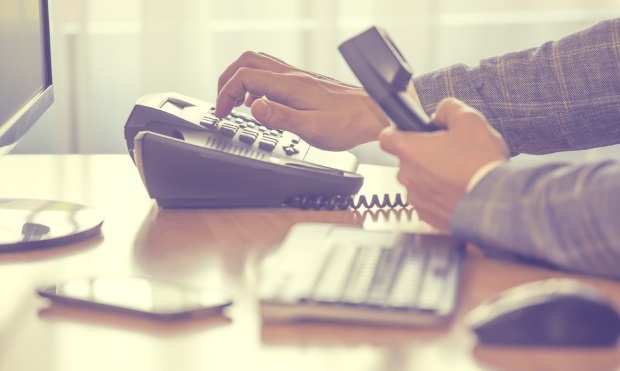 You can use the same data connection to add more phone lines to your VoIP system, ideal for businesses with fluctuating staff levels. One thing that makes any VoIP hosted phone system stand out among traditional phone systems is the cornucopia of features and benefits that are available upon signup. The systems are loaded with extras that can help save time, money and manpower. Clear and crisp video conference calling can bring multiple offices or employees together regardless of location. Employees can also check their email via the VoIP system, and utilize convenient options such as voice to text and text to voice conversion. In addition, the file sharing options and capacities make the transfer and accessibility of various data types a breeze. With VoIP, users can engage in video chatting with a person who also uses a VoIP service if they prefer actually seeing one another during calls. This is a perk that comes with VoIP that traditional phone service cannot match. Video calling on VoIP works even if the call recipient resides in another country or continent. VoIP service allows for more than mere one-on-one calls. It can accommodate multiple people. This is an important factor for businesses that operate with customers and employees who are spread throughout the globe. The call takes place in real-time and, because VoIP compresses data, more calls can be handled on the line at any one time. In other words, two or more people can make VoIP calls in the same home or office at the same time without running into the problem of interference. Because VoIP operates over the Internet, you can do more than just engage in phone or video calls. You can also transfer text messages and videos to the recipient in addition to just audio. Many VoIP apps that are available for smartphones or tablets now include text messaging that allows users to conserve texts through their wireless carriers. When using VoIP, you can more efficiently use bandwidth. Generally speaking, around half of all voice conversations consist of silence. However, VoIP technology fills these silent spaces with data, which ensures that the bandwidth that is used within the communication is not wasted. What this means is that when there are patches of silence during a VoIP call, the bandwidth is not wasted but is instead utilized for other individuals who are using the bandwidth on their own computer or other device. When VoIP is used for business, a person who works from home can rely on this means of communication to keep in touch with others in the office. This is excellent for freelancers who reside in other states or abroad. The individual can engage in calls through VoIP for business and carry out other tasks, such as faxing through their company's intranet. There are many different providers of internet phone services offering a range of packages, both for residential customers and businesses. Before selecting an Internet-based virtual phone system, it is advised to compare the leading VoIP providers. Every provider offers different packages. VoIP’s cost-saving benefits and extra features make it a good alternative to traditional phone service. Setting up a VoIP system is effortless and quick whether you’re a residential or business customer.